I promised myself that I would learn to speak and write at least two new languages (to at least somewhat-acceptable conversational level) within the next three years, that means my deadline is by the end 2021. ⏳ But why Mandarin, the standard Chinese language? 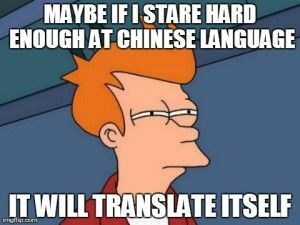 Maybe if I stare hard enough at Chinese language, it will translate itself. And why am I writing this on my blog? As John C. Maxwell said, if you want to do something, then be committed, and make your commitment public, then finish what you started. Ni hao ma? 你好吗? How are you? Wo hen hao, Ni ne? 我很好!你呢? I am fine, you? Zai tjian. 再见. Good bye. Zao an. 早安. Good morning. Wu an. 午安. Good afternoon. Ni yeshi. 你也是. You too. Ni jiao shenme mingzi? 你叫什么名字？What is your name? Xie xie, duoxie. 谢谢, 多谢. Thank you; Thanks a lot. Wo bu dong. 我不懂. I don’t know. Shengri kuaile. 生日快乐. Happy birthday. Jintian, zuotian. 今天, 昨天. Today， yesterday. -mei / xiaojie. – 妹 / 小姐. Sister. Baoqian / Duibuqi. 抱歉 / 对不起. Sorry. Shi, Bu. 是，不. Yes, No/not. Huoche / huoche zhan. 火车 / 火车站. Train / train station. Huida / da’an. 回答 / 答案. Answer (verb) / (noun). Cuo, Dui. 错，对. Incorrect, Correct. Weishenme? / yinwei. 为什么？/ 因为. Why? / because. So, what do you think about Mandarin?